I have heard it is very difficult for a pilot to land on a carrier deck. I have read this question but it didn't really give me a sense of the challenges that pilots face. This question lent me the insight that metal decks, themselves, have different properties (that I should have considered)... perhaps friction, changes due to thermal shifts (that asphalt does not exhibit), perhaps it 'gives' differently under touch-down pressure. Can someone paint a more-complete picture? I'm sure there are also other factors, besides that the deck is moving.... but even then - perhaps there are 'different kinds' of movements of the deck that I haven't considered. Since another user, with actual carrier experience, has given a detailed answer, please refer to his answer. It now appears that a good part of my answer was incorrect. As I wrote in the beginning, my answer was based on flight-sim experience, and reading, but nothing formal or official. I'll leave my answer up, solely for historical reference, unless the better answer gets accepted. I've never done it IRL, but read about it lots, and Flight Simmed it many times, so I'll take a stab. When landing on a fixed runway, your glide-path is pretty much right towards the end of the runway. Its not like that at all on a Carrier. From up high, you are actually aiming for a point in front of the carrier. You're aiming for where the runway will be in 30 seconds. As you get closer, the carrier moves closer into position. But still not entirely in position until the last second. So you're always aiming for an invisible/imaginary point where the runway will be at the last second. 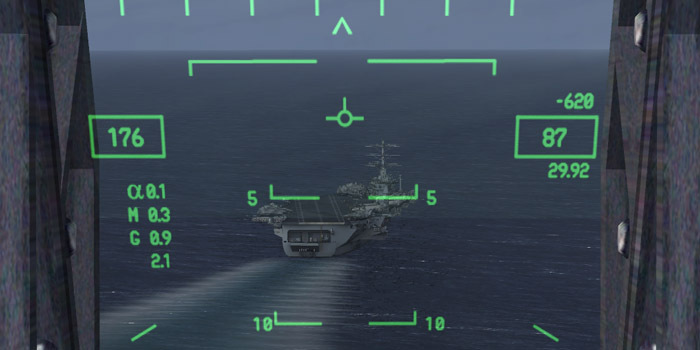 Notice that the flight path indicator (the little circle in the HUD) is well beyond the front of the carrier. If this plane was landing on a runway, the flight path would be aimed right at the numbers. In a typical runway landing you flare out just before touchdown, "float" for a second and drop on to the runway. In a carrier landing, you maintain your glide-path attitude all the way on to the deck. There's no flare or float. This helps you hit exactly the spot you're aiming for (the 3-wire), but in some sense you really are crashing into the deck at a not-inconsiderable descent rate. Remember the glide path to the imaginary touch-down point? Because the carrier deck can be pitching or rolling in the waves, that imaginary touch-down point is not a fixed distance directly in front of the ship. As the ship bobs and weaves around, your touchdown point is moving around too. That makes it even harder to hit the point right. It can well be at the last second, as your plane is dropping quickly, the deck suddenly jumps up to meet you, making the impact even more violent. The landing part of a carrier deck is the diagonal part on the back of the deck. It is angled about 20-degrees to the left, relative to the carrier. But it is moving directly forward with the movement of the carrier. This means the "runway" is not moving directly away from you, but slipping sideways. First I would like to dispel the common misconception that the ship’s forward motion relative to the water requires the pilot to aim for a point forward of the intended point of landing. It does not. The approach is flown the same whether the ship is stationary or moving. For any pilots out there, do you aim for a different landing point on the runway depending on the wind? Probably not, you shoot for the landing area and adjust the controls for the effects of wind to arrive in the same spot every time. If winds are calm you need less power to maintain glideslope, if winds are strong you will need more power for the same glideslope. It is the same thing at the boat. We don’t care about our motion relative to the water, only the ship and the wind matters. Now, I flew steam gauge Prowlers so I can’t speak to the HUD, but my Hornet friends would tell me that they initially put the velocity vector in the notch between the end of the landing area and the port side forward. So, this is a little forward of the intended touchdown point, but not nearly as exaggerated as the screen captures I've seen depict. The pilot should then fly other visual cues to touchdown. I would presume that as the computer stabilized and updated as they came down the groove that the pipper would settle right in the landing area. However, without the benefit of a HUD there is zero pilot adjustment made for ship’s forward motion. And even with this tool the flight computer should adjust for the effect of wind and put the pipper in the landing area where the plane is headed, right? Bottom line, we don’t care about or even notice the aircraft or ship motion relative to the water during final approach. Our perception, and the net effect of the ship’s forward progress, is on wind only. We are trained to fly glideslope, line-up, and aircraft angle of attack all the way to touchdown. Overthinking things only leads to confusion, and spotting the deck is highly discouraged. There are a few caveats to that last paragraph concerning ship motion: We make note of natural vs ship generated wind. When there are whitecaps and little to no ship’s wake we anticipate natural winds right down the angle. If the sea is calm and there is a boiling wake behind the ship we know the ship is steaming hard to make wind, so there will be a slight right crosswind and some turbulence from the island. And finally, the ship may turn during your approach. They really try not to, but sometimes they do, and it can make chasing line-up a bit sporty! To summarize and answer the main question, landing on an aircraft carrier isn’t inherently all that much more difficult than other aviation tasks that require a high degree of precision. I have been into a pretty tiny little runway, and been bounced around by wicked crosswinds in light civil aircraft and it put a very similar level of strain on my pilot skills. A big part of it is mental. There are plenty of good pilots out there who can fly an ILS on the rails that would probably make it in Naval Aviation. It just takes a level of commitment, training, and discipline to succeed over a sustained period time. P.S. I have 300+ traps and was a wing qualified LSO in case anyone is wondering about my credentials. Landing point is extremely small for the speed the aircraft approach at for landing. Landing point pitches up and down. Landing point is not stationary, but is a moving point. The metal underground won't matter. It will have a special friction surface. It is very sturdy. The cable will stop the aircraft. The reason it's so hard is mainly because the touchdown zone is very small, especially for such fast and heavy airplanes. There is also the stress of knowing that if the plane strays outside of the tiny landing area it can impact other aircraft, or parts of the ship. Ship movement is a factor, but not as much as you might think. The optical glideslope system is gyroscopically stabilized (or manually stabilized in more severe conditions), so theoretically the pilot just has to fly the procedure. The system is so precise that it even adjusts for the size of different aircraft so that airplanes of all types touch their tailhook in the same place. The landing gear shock absorbers have a long range of travel and are unsprung. So when the plane touches down a lot of energy is absorbed by the struts without bouncing the plane back up. But even these struts can only compensate for a limited descent rate. It's very important that the wheels touch down on a low approach, because if the tailhook engages in flight the plane will likely be irreparably damaged, with possible injuries or loss of the crew. The landing itself isn't difficult; what is difficult is precisely tracking a moving certerline and glideslope right down to touchdown within a small area of the deck in order for the jet's tailhook to snag a cross deck pendant. Get too high on the approach, you will miss the wires (bolter) and have to go around. Even worse is a low approach where there is a risk of smashing straight into the back of the ship (rampstrike). Add to this that most tactical aircraft are flying the approach at 120-140kts, giving very little time to correct errors as the jet gets in close to the boat. The approach gets even more difficult when the ship pitches and rolls in rough seas as well as at night or in marginal weather making an instrument approach, where visual cues are diminished or nonexistent. What it takes is an ability to fly the approach with very little deviations combined with rapid small corrections in position, speed, angle of attack, etc. during the approach. Great video of CAW 11 aviators aboard the Nimitz off the coast of Australia in Oct 2004 attempting to trap at night in rough seas with swells +/-30 ft. There's an airfield somewhere in the United States with a metal runway. Where is it? Has an unauthorized civilian ever tried to land on an aircraft carrier?